Habit: Plant < 1.7 m, weakly clonal; bulb scales 1--2-segmented. Leaf: whorled (or alternate especially in small plants), +- linear. Flower: perianth parts 4.8--8.3 cm, 2-toned, tips darker; anthers 5--18 mm, magenta or purple, pollen red-orange or orange; pistil 3.5--5.3 cm. Fruit: 2.5--5 cm. Ecology: Peatland, streams, springs; Elevation: 100--1200 m. Bioregional Distribution: w KR; Distribution Outside California: southwestern Oregon. Flowering Time: Jul--Aug Note: Hybrid swarms with Lilium pardalinum subsp. wigginsii in western Siskiyou Co. Plants in deep shade generally have wider leaves, are much like Lilium pardalinum subsp. pardalinum. 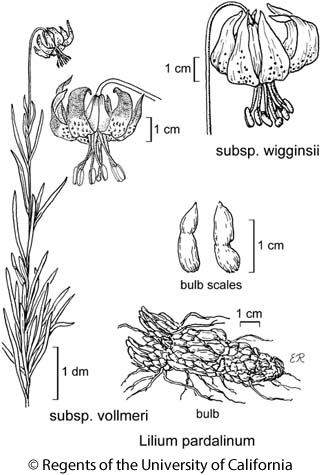 Citation for this treatment: Mark W. Skinner 2012, Lilium pardalinum subsp. vollmeri, in Jepson Flora Project (eds.) Jepson eFlora, http://ucjeps.berkeley.edu/eflora/eflora_display.php?tid=51256, accessed on April 24, 2019.
w KR; Markers link to CCH specimen records. Yellow markers indicate records that may provide evidence for eFlora range revision or may have georeferencing or identification issues. Purple markers indicate specimens collected from a garden, greenhouse, or other non-wild location.